The Amish Preston Single Pedestal Table is the perfect combination of classic style and sleek design. Conveniently sized to accentuate your dinette or kitchen area, this cozy and casual Shaker pedestal table is handcrafted to invite hours of comfortable dining and conversation. Huddle around this magnificent dining table to play boardgames, dye Easter eggs, bake Christmas cookies, and craft your New Year resolutions. 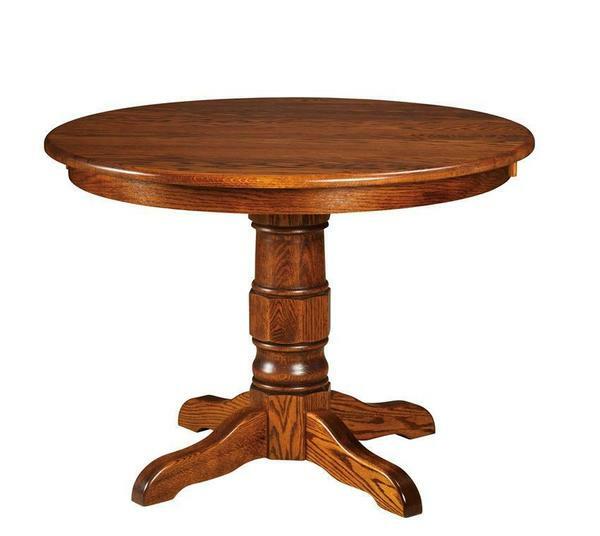 This solid hardwood single pedestal table will support you and your family through it all! Allow this stunning and authentic Amish pedestal table to become a staple in your home. Gather around this skillfully crafted dining table for all those family meals and activities. Complete your unique set with the Amish Preston Dining Chair for a beautifully put-together dining area! Stop by and check us out at our Amish furniture store in Sarasota, Florida or call one of our Amish furniture specialists at 1-866-272-6773.